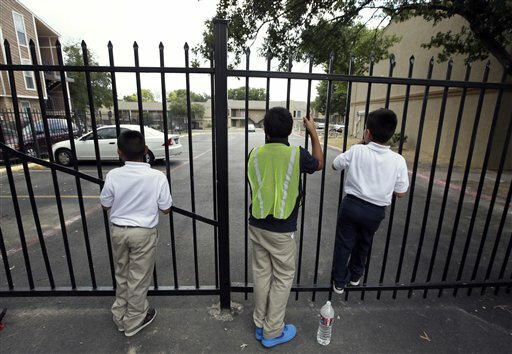 Three children on their way home from school stop to peer through the gate down at a building at The Ivy Apartments in Dallas where a man was diagnosed with having the Ebola virus was staying with family at the complex. Ebola is giving Americans a crash course in fear. Yet, they’re incredibly less likely to get the disease than to get sick worrying about it. First, the reality check: More Americans have married Kim Kardashian — three — than contracted Ebola in the U.S. The two Dallas nurses who came down with Ebola were infected while treating a Liberian man, who became infected in West Africa. The New York doctor who has tested positive for Ebola had been treating people in West Africa. Still, schools have been closed, people shunned and members of Congress have demanded travel bans and other dramatic action — even though health officials keep stressing that the disease is only spread through direct contact with bodily fluids from an infected person, and the risk to Americans is extremely low. That’s because Ebola pushes every fear button in our instincts, making us react more emotionally than rationally, experts say. Holman found in studies published by the American Medical Association that the people who spent more time watching television coverage on the Sept. 11 attacks — and reported fear and anxiety — were three times as likely to report new heart problems. The more coverage they watched, the more physical ailments they reported, she said. Similarly, after the Boston Marathon bombing, people who watched six hours or more of coverage reported far more stress than those who watched less, Holman said. That was true even for those at the bombing. Bruce McEwen, a neuroscientist who studies stress at Rockefeller University in New York, said the fear can lead people to change their lifestyle, making them isolate themselves, lose sleep, stop exercising, change their diet for the worse and drink or smoke. “It’s likely to cause them problems down the road even if there is no direct infection,” McEwen said. There are two types of fear that can almost come down to good fear and bad fear. The good fear is the type we look for around Halloween in haunted houses or on roller coaster rides at amusement parks. It’s short, intense, gets our juices going and removes boredom, said Vanderbilt University psychiatry professor David Zald. There’s a sense of mastery or bravery that comes out of walking out alive from a haunted house or giant roller coaster, Zald said. That type of acute-but-short stress actually makes our immune system work better, McEwen said. But long-term exposure to stress has the reverse effect on the immune system. That’s when it elevates our blood pressure and contributes to heart disease. One of the major unknown problems with risk and fear is that the public doesn’t understand how at risk they are from worry, not disease. “It’ll do far more damage than the disease,” said David Ropeik, who teaches risk perception and communication and has written two books on risk. Doctors and government officials tell us not to worry and how hard it is to get Ebola, which is re-assuring, Ropeik said. But “all the alarms are filling up on our radar screens,” and we give more weight to the alarms because of the fear of death, he said. Ebola pushes “all those fear buttons” because it is new and foreign, said George Gray, director of the Center for Risk Science and Public Health at George Washington University. Americans who say they don’t quite understand how Ebola is transmitted report being more worried than those who say they do, according to an Associated Press-GfK Poll conducted in the past week and released Wednesday. Overall, 58 percent of those who acknowledge they don’t understand Ebola very well say they are concerned it will spread widely in the U.S., compared to 46 percent of those who say they understand Ebola transmission. We fear what we can’t control. People often fear the far less deadly plane travel than driving because they aren’t in control. Seeing trained medical professionals catch the disease despite protective gear only adds to the fear, Zald said. Instead of using dry statistics such as 1 in 150 million, comparing your chances of contracting Ebola in America to that of marrying Kim Kardashian helps people understand and visualize risk better, Zald and Schuster said. Mistakes and wrong statements by public health officials and politicization of the issue only make fear and public trust worse, said Baruch Fischhoff, a professor of decision sciences at Carnegie Mellon University. Add wall-to-wall coverage that makes Ebola easy to picture. “You create this hysteria about Ebola and unfounded fear, and people get all worried,” Holman said.